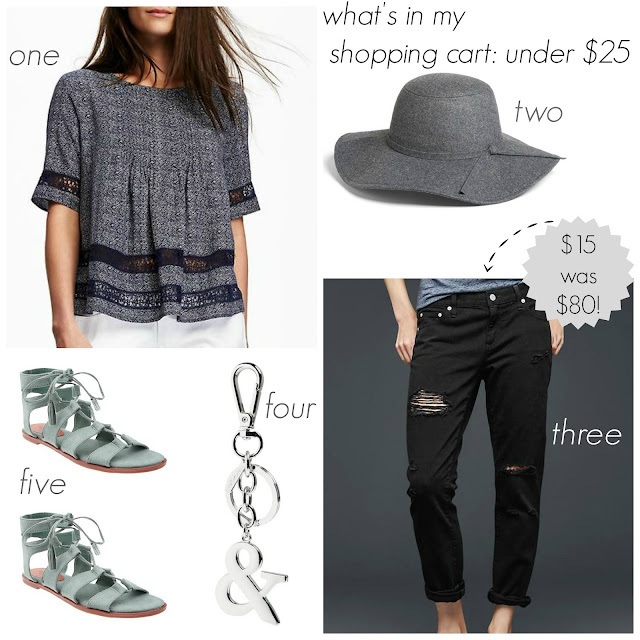 Tracy's Notebook of Style: Shopping Cart: Gap + Old Navy + Banana Republic 35%-40% off! 1 ON Swing Top $19.76 ($32.94) I've been wanting this top since last month, it actually looks more Banana Republic style in person. 2 Leith Floppy Hat $15.60 ($26) I've shared this hat before whenever it pops up on sale, the grey works well with just about everything. 3 Gap Girlfriend Jeans $14.99 ($79.99) I purchased the olive color a couple of months ago and love them, such a steal at this price and who can resist black distressed jeans for under $15?! I really love adding keychains to my handbags and remember how much I loved this, but not at full price, haha. Keep in mind, it is pretty large, not a tiny little charm. 5 ON Gladiator Sandals $19.46 ($29.94) ...because you can never have too many gladiators! Gap always has crazy deals on pants...but $15 for those girlfriend jeans? That's crazy! I could not believe the price on those and they are seriously cute on too! Love this whole look you put together! I'll have to head over to ON to check things out!